There is this mural that I absolutely love that's by the railroad tracks near the new Fresh and Easy store. The funny thing is though, there is a sign right next to it frowning upon it. 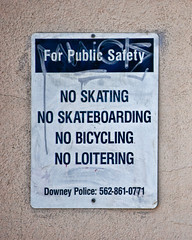 So is it a popular spot for skateboarding or is the sign scaring them away? I like the muraL of the skater-boarder. You city officials are taking their title to heart, just like ours. In search for the perfect Gazpacho.